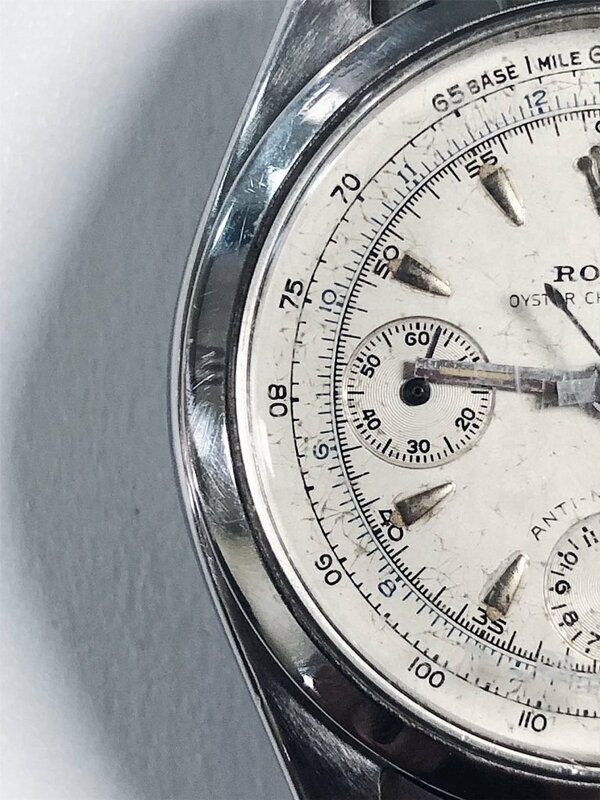 The Rolex Oyster Chronograph Reference 6234 is often considered the grandfather of the Rolex Daytona. Produced from 1955 to 1961, it offers many of the same features as the Daytona, but lacks much of its technological innovation. For example, reference 6234 utilizes Rolex Caliber 72 with 17 jewels and column wheel construction. 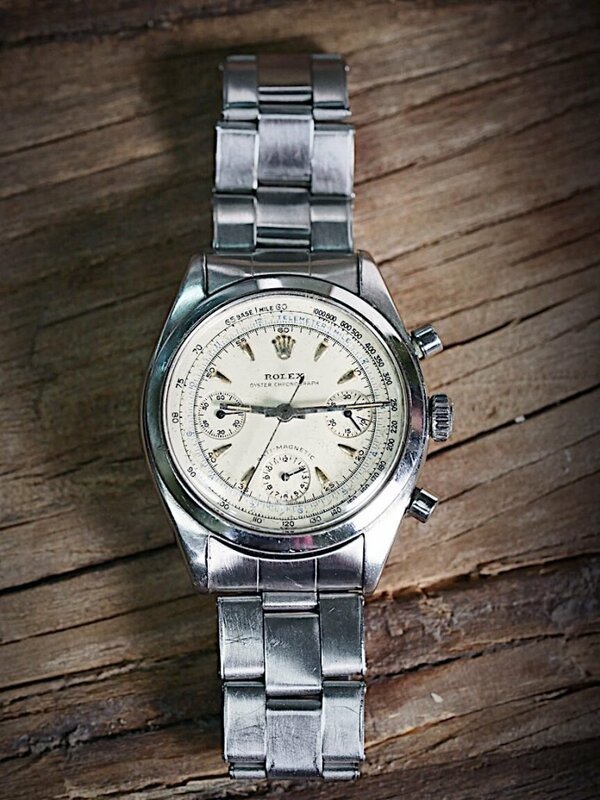 Thus, reference 6234 lacks an automatic movement, as the Daytona possesses. Rather than automatically winding with the flick of the wrist, reference 6234 must be manually wound. 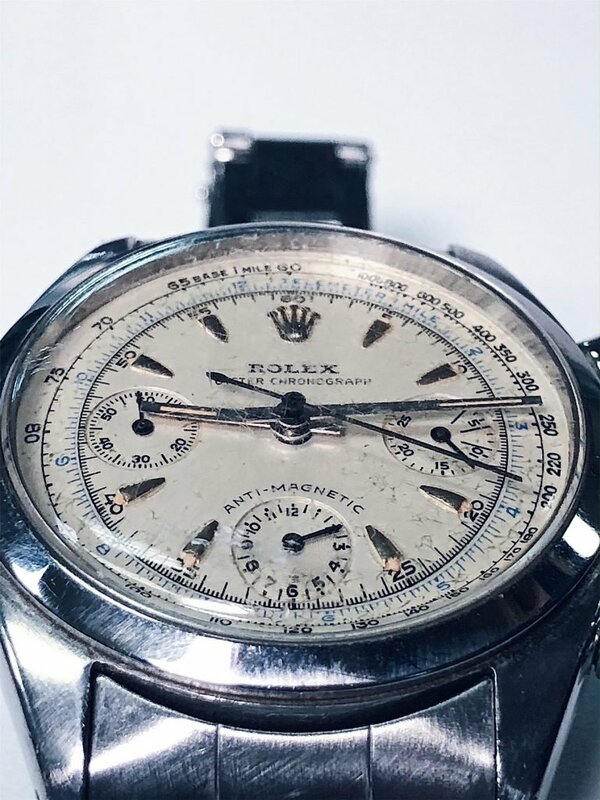 During its 6 year production run, Rolex produced around 500 reference 6234’s per year, averaging at a full production number of about 2300 stainless steel models and less than 150 14k and 18k gold models. The dial was also varying in design, with some watches featuring a white dial while others featured a black dial. Each dial features applied dagger numerals with luminous accents and luminous hands. Each timepiece is also signed by Rolex on the dial and case. The three sub dials featured on the main dial also varied between some pieces. The three sub dials offer a constant seconds counter at 9 o’clock, a 30 minute counter at 3 o’clock, and a 12 hour counter at 6 o’clock. These sub dials allow the wearer to simultaneously measure speed and distance. Reference 6234 also features a tachometer scale on the outer ring and a telemeter scale for distances on the inner ring. The timepiece is topped with a plastic crystal, rather than the later synthetic sapphire crystal. Each watch is also typically finished off with an oyster riveted bracelet. Depending on the watch finish or later alteration the oyster bracelet could be made of stainless steel, 14k gold, 18k gold, or leather. 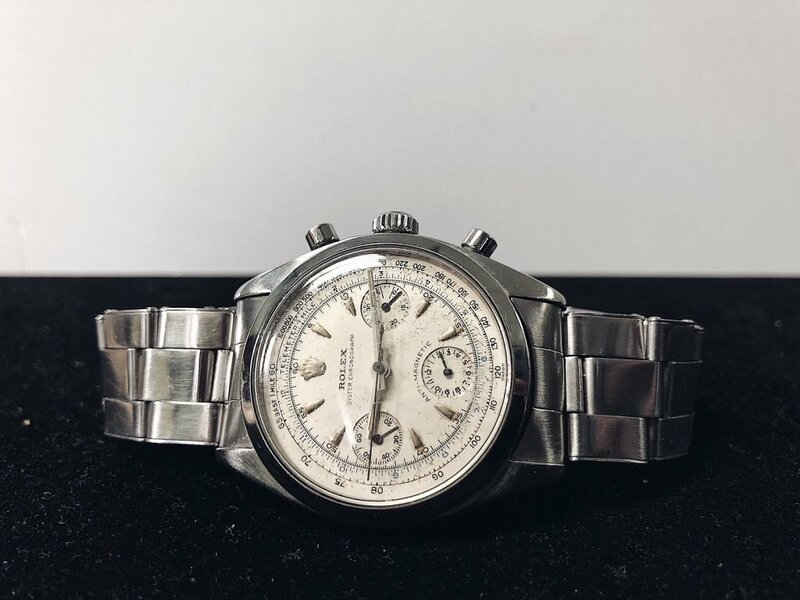 Some similarities between the later Daytona and reference 6234 include the utilization of Rolex’s patented oyster case, which can withstand water pressure and remain waterproof up to 200 meters. The oyster case maintains its water resistance through the use of three components; bezel, case body, and screw down case back. The Oyster crown is set at the 3 o’clock mark and is flanked by twin round pushers, giving the watch a sporty look. Though not a Daytona feature, a surprising technically innovative feature of reference 6234 is its magnetic resistance, which aids in maintaining the timepiece’s precision and accuracy. 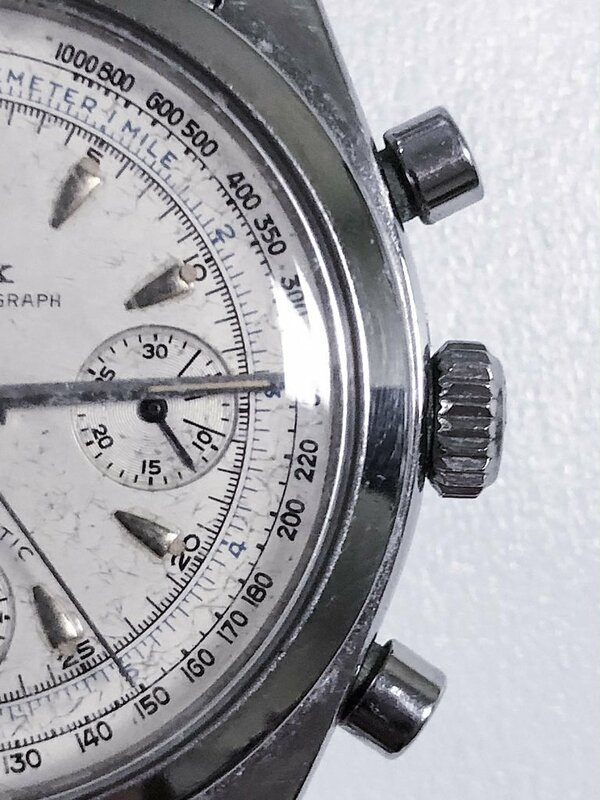 As the forerunner of the Rolex Daytona, the Rolex Chronograph 6234 is one of the most prized vintage Rolex watches. While it does not offer the convenience of automatic winding, it does offer many wonderful features Rolex eventually incorporated into their later models. 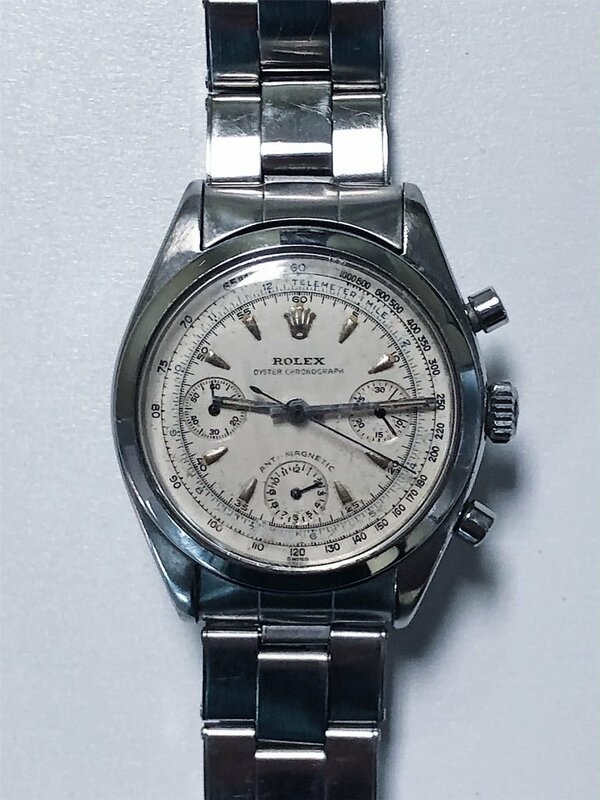 The Rolex Chronograph 6234 is a must have piece for any Rolex collection, not only as a wonderful example of Rolex history, but as a vintage, yet extremely wearable watch.